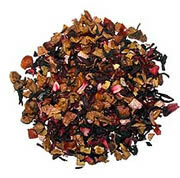 One of the fastest growing segments of herbal teas are what is known as "whole fruit teas." Whole fruit teas are herbal teas that contain dried fruit pieces, such as apples, oranges, peaches, raisins and the list literally is endless. Thus, when you have a whole fruit tea...don't be surprised to see massive chunks of dried fruit pieces instead of leaves from various herbal plants! If there is one characteristic of whole fruit teas among the many different types I've tried, it is their very strong taste. When properly brewed, these teas pack quite the punch. For this reason, if you are looking for a more subtle tea, you'll likely want to find another tea type to try. Listed below are links to reviews on this site of various teas that are whole fruit teas. Just click any of the links to read the full review.